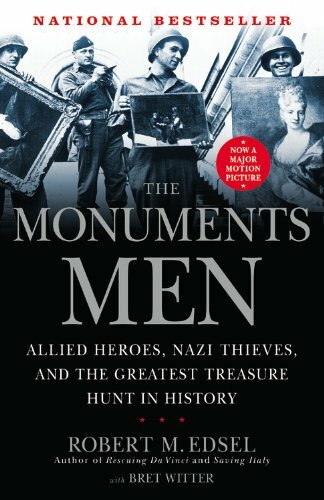 The Monuments Men by Robert M. Edsel and Bret Witter is an exceptional history of the valiant men and women whose mission during World War II was to locate and save the countless art treasures looted by the Nazi regime. Perhaps you have seen the movie by the same name, but I highly recommend reading the book as there is so much more to learn and Hollywood has not changed it to suit their purposes. This story about a brave corps of men and one woman from several countries and walks of life, is truly astounding. Their selfless contributions to the preservation of civilizations is beyond measure. I learned a great deal more about the systematic Nazi looting during the war and coupled with the knowledge I already possess of the loss of so many innocent lives, much of the story was heartbreaking for me to read. It was however, uplifting knowing that because of these brave, committed individuals, much of the beauty and culture which might have been lost has been saved for future generations. I think this is an amazing book and am grateful to the men and woman who lived the story it tells. This entry was posted in Uncategorized and tagged Books, Bret Witter, george stout, Harry Ettlinger, history, jacques jaujard, james j. rorimer, lincoln kirstein, military, monuments men, Robert M Edsel, robert posey, Ronald Balfour, rose valland, walker hancock, walter hutchthausen, WWII. Bookmark the permalink. I ended up seeing the movie after I had finished the book and was kind of horrified that these brave men (and women) were reduced to a kind of Oceans 11 with Nazis. Usually the book is better than the movie but in this case, the book stands alone. I was filled with the same gratitude for these souls who thought to save centuries worth of culture so that we could still have culture. I totally agree with you! The movie and falsified versions of truth made me angry. The book is tells the much preferred truth. Thank you for sharing your insights! Please share your opinion of the book afterward!